... today I pulled out that umbrella. Several of them. After work today I packed up my stuff and booked it out of school. I drove to a cafe/creamery. I ordered a 1/2 pistachio 1/2 Creme Brule gelato and an iced chai tea (yum yum!). I sat down at a big booth and pulled out my laptop. I plugged in some headphones and made a playlist. I am going to sit and blog, catch up on some blogs that I haven't had time or energy to read. I brought a book, or maybe I will just sit and... just sit. Who knows. But what I do know is that the storm is easing. Even if just for this hour and a half the storm doesn't seem so bad. 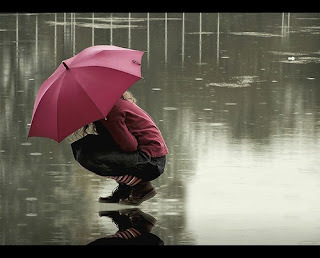 I hope you all have a chance to pull out your umbrella, to recharge and take some time for you.